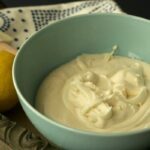 Wow, it took me quite a long time to nail this vegan jello recipe. I’m not much of a jello person really, which is good because it’s not something you find vegan varieties of very often. 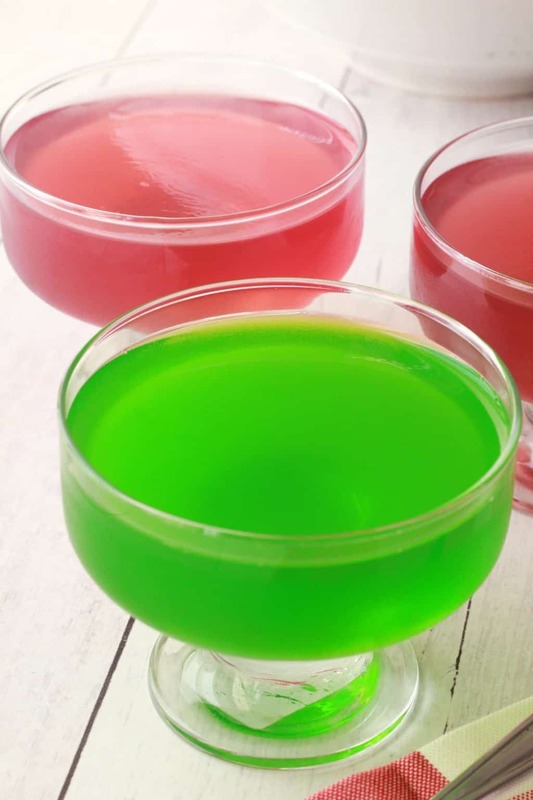 Usually jello’s use gelatine which is a by-product of the meat industry. But I decided to rise to the challenge of making a vegan jello because I wanted to make a Christmas Trifle! And in South Africa a Christmas Trifle almost always contains jello. Or what we call ‘jelly’. Green and red jelly/jello to be precise. You know, lovely Christmas colors! 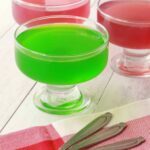 Everything I read online told me that agar agar was the magic ingredient in vegan jello. So off I went to find some. An organic/health food store had some in stock, but only the flakes version (and at first I didn’t know there was any other version to get!). 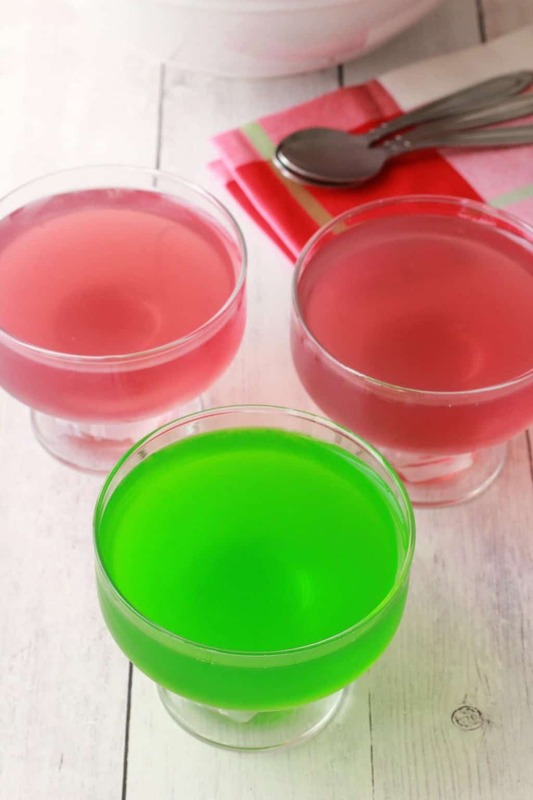 So off I went and tried to make a recipe that I got from PETA, that advises to use 2 Tbsp of agar agar along with fruit juice and a little sugar. Well…. if jello is meant to be a rock hard brick, then sure! But there was no jiggle in that jello and that’s just not jello in my view! So… back to the drawing board. I found another recipe that said to use half fruit juice and half water and only 1/2 tsp of agar agar. Needless to say that is a HUGE difference. But when I tried it that way my jello didn’t set at all. Again…back to the drawing board. And that’s when I found out from this article that agar agar is either in flakes OR in powder form. When it’s in the flake form you need up to 3 times as much as if it was in the powder form. OH! I see! The penny droppeth! So I then used the same recipe but adjusting for the fact that I was using agar agar flakes and not powder, so using 1 and 1/2 tsp instead of 1/2 tsp and then the magic happened. Perfectly textured, delicious tasting jello! Absolutely perfect to use in a recipe calling for jello – like my Trifle – or to enjoy as is! So remember this lovely people! Agar agar powder is up to 3 times as strong as agar agar flakes. So if the recipe calls for powder and you have flakes, use up to 3 times as much. Easy as that. 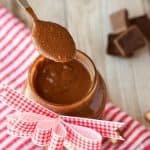 Update: I have since made this recipe using agar agar powder and found it takes a little more than 1/2 tsp, so the calculation is close but not exact! Directions for both inside the recipe card. 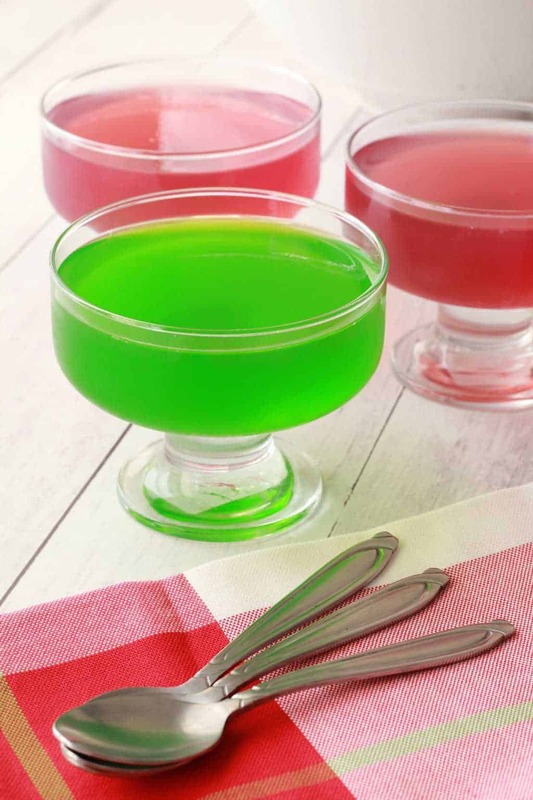 Enjoy it as a dessert or use it in a recipe that requires jello. 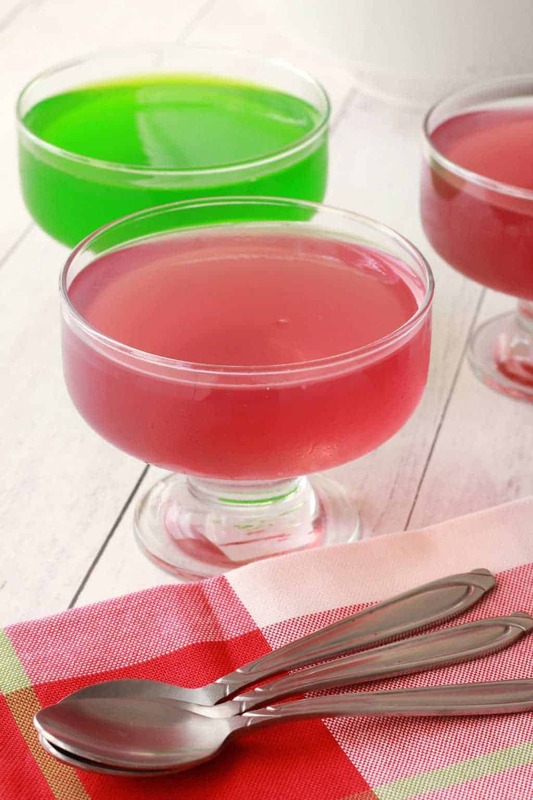 You can mix and match flavors just by switching out the fruit juice you use. Pretty cool. 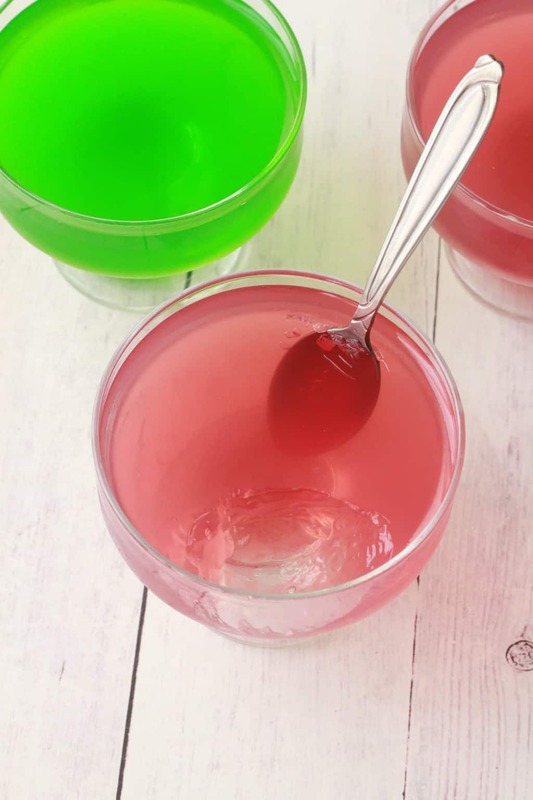 Let me know in the comments what you think of this vegan jello and rate the recipe too, thanks! And if you’re going to use it in another dessert recipe, let me know where you’ll use it. Other than a trifle I’m not sure what else I would put it in. Oh wait, vegan jello shots of course! But eating it as is, is pretty fun too. And if you haven’t already, sign up to our email list to get a fabulous free recipe ebook containing 10 awesome recipes and to stay in touch with all our latest recipe postings. Yippee! 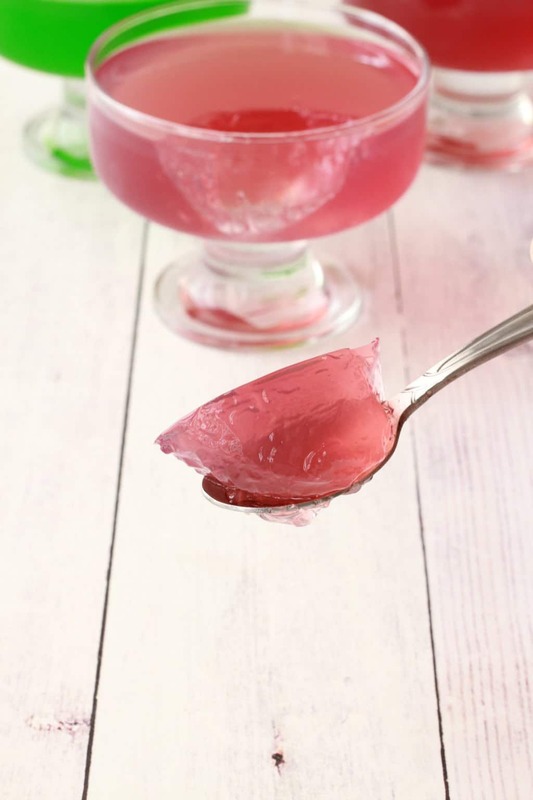 Fun and fruity vegan jello. 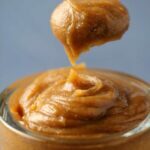 Perfect for use in other desserts or to eat as is. 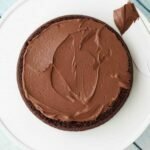 Perfectly textured, deliciously sweet, gluten-free and vegan. For the red jello: Add the agar agar flakes or powder, water, fruit juice and sugar to a pot on the stove. Bring to the boil stirring regularly. Allow to boil for 2 minutes. Pour out into serving bowls or glasses. 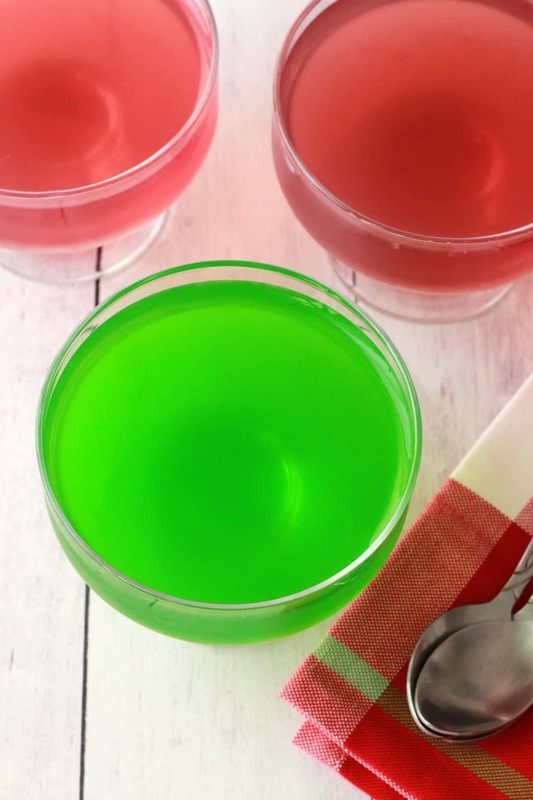 For the green jello: Follow the steps as above, but after boiling for 2 minutes, remove from the heat and stir in the green food coloring. Pour into serving bowls or glasses and refrigerate to set. *The green food coloring is added in to get the green color because green apple juice is more cloudy in color than green. However, if you don’t like using food coloring you can omit this step. Some brands of green food coloring I’ve used up to 1/4 tsp of color before it gets to the right shade, other brands are stronger and I’ve only needed a couple of drops, so go slow if you’re adding it in. 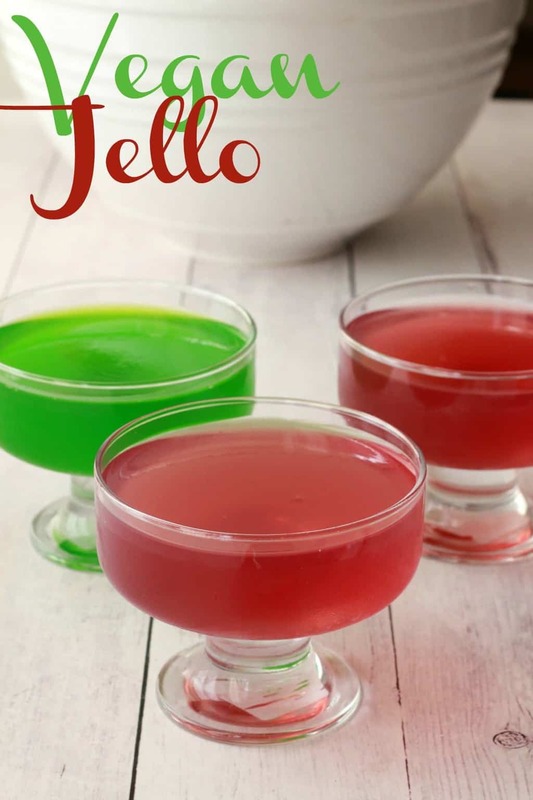 *Each batch (green or red) makes around 2 cups of jello. 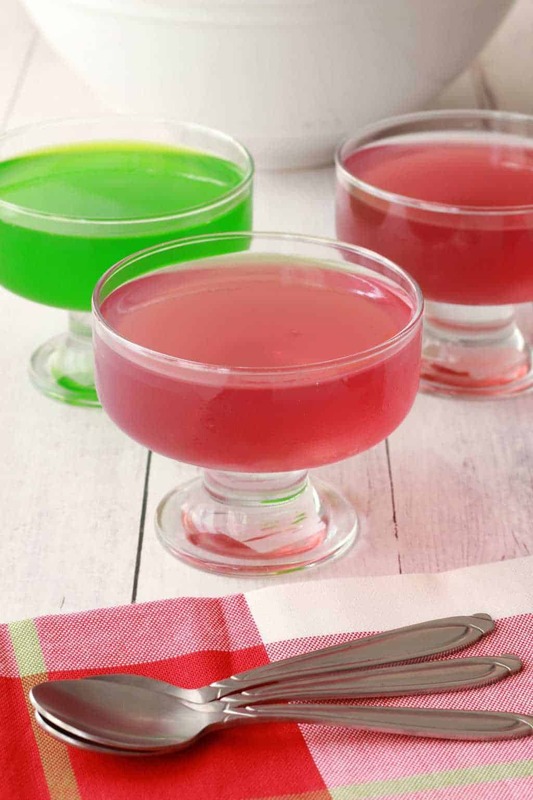 To make jello shots, check out our recipe for Vegan Jello Shots. I am just wondering about the sugar. What kind of sugar? 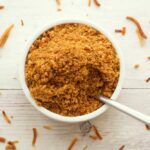 And have you tried other kinds of sugar like coconut sugar? Hello! my question is, what would be the measurements for 20 children plus their parents. I’m make this jello with my preschool children. I honestly have no idea! I have not tried increasing this recipe. Just wondering would this recipe work with any fruit juices IE pineapple cranberry, etc. 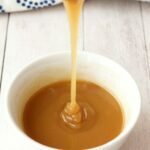 Do you think I can use honey or maple syrup as a sweetener? If so, any idea how much? Should I just do it to taste? Or do you think the consistency would change depending on the amount.